LOS ANGELES -- Even the movie moguls of Hollywood might find the script Giants second baseman Joe Panik has written over the season's first two days too preposterous to turn into a film. Panik homered off All-Star Dodgers closer Kenley Jansen in the ninth inning on Friday, the only run in the Giants' 1-0 win in Los Angeles. It was a familiar scene: Panik's fifth-inning homer on Thursday off Dodgers ace Clayton Kershaw was the only run in San Francisco's win on Opening Day. "This spring, I felt really good about my swing and just carried that momentum into the season," Panik said. "Granted, for me as hitter, two home runs in two games off those guys, that's a good feeling. It's not something you really expect or try to do." 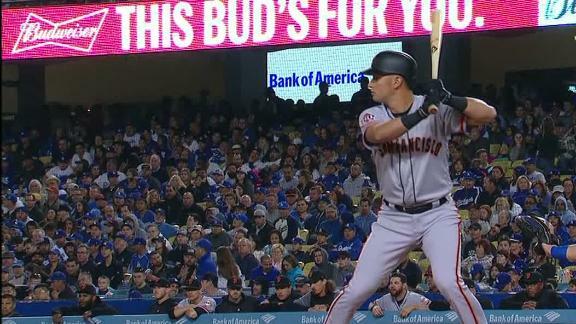 According to the Elias Sports Bureau, Panik became the first player to homer for his team in back-to-back 1-0 victories. In a sport as old as baseball, that's impressive enough. But to do it at Dodger Stadium, against Kershaw and Jansen, in the season's first two games -- that's a case of truth being stranger than fiction. "Clayton dropped down a little bit, and that ball I thought was going to hook foul, then [Panik] comes out the next night and hits one off the best closer of the game," said Giants manager Bruce Bochy, who, with the win, became the first opposing manager to win 100 games at Dodger Stadium. "Two games, and to win the games 1-0, I've never seen that in all my years." Hits have been hard to come by during the first two games of the series, much less runs. The teams combined for just three hits Friday. Before Panik's blast, the Giants' only hit against L.A. starter Alex Wood was Brandon Crawford's infield single in the fifth. Meanwhile, San Francisco's Johnny Cueto carried a perfect game into the seventh inning before giving up a solid single to Chris Taylor to lead off the seventh. Bochy said that Cueto, who threw 97 pitches over seven innings, probably would have been replaced by a pinch hitter in the eighth even if his perfect game bid had remained intact. "I wasn't even thinking about that," Cueto said via an interpreter. "My concern was just to go out there and put the pitches where I wanted to. If the no-hitter was going to come, then it would come." Tony Watson and Hunter Strickland came on to throw a perfect inning apiece to finish off the win and give the Giants an early two-game lead over their hated division rival. "It's a great feeling, coming into Dodger Stadium the first two games like that," Panik said. "With Kershaw and Wood, two very good pitchers, they did some really good work. For us to come out of here with two wins, it's a great feeling. When you're playing against NL West teams, every game is going to matter." For the Giants, as good as the wins are on their own merit, the method of winning may be just as important. San Francisco's pitching staff is minus three key pieces to start the season, with starters Madison Bumgarner and Jeff Samardzija, plus closer Mark Melancon, all beginning the season on the disabled list. "It's huge for these guys," Bochy said. "They took a pretty good blow, losing Madison and Shark and Melancon. To come away with these two wins, sure, that's got to do a lot for them." The Giants, who lost 98 games last season, did not win a 1-0 game. This year they have already won two. Panik became the second player to homer off Kershaw and Jansen in the same season. Arizona'sPaul Goldschmidt did it in 2013. The Dodgers have been shut out in consecutive games to start the season just twice, the other time coming in 1968. The only other team in the past 100 years to start the season with two 1-0 victories was the 1943 Cincinnati Reds. As for Panik, his heroics during the season's first two games have earned him the honor bestowed upon many Giants starters over the years by the Dodger Stadium faithful: He was booed. "It's a good feeling coming into Dodger Stadium and hit a home run in the ninth inning and they boo," Panik said. "That means you're doing something right." Joe Panik hits a solo home run to right field to give the Giants a 1-0 lead over the Dodgers in the ninth inning.